Cymbals can quickly push up the price of a drum kit. A good set of cymbals will often cost more than the drums themselves – especially when buying new. For this reason, it makes a lot of sense to buy used cymbals rather than new ones. 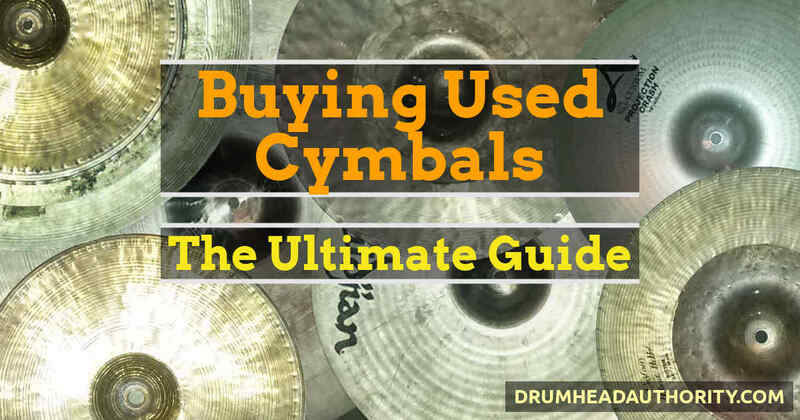 This used cymbals buying guide follows on from our huge guide to buying used drums – make sure you read this if you’re buying used drum gear. There are a lot of important things to look out for to ensure you get a great used drum kit and not a lemon! Like drums, there are some big deal breakers when it comes to buying used cymbals… Even the best cymbals will be worthless if they’ve been badly treated, so make sure you know the warning signs. With this in mind, I’ve written this article covering the important stuff, the not-so-important stuff, and some extra tips along the way. All of this is to help you find the best used cymbals for your kit! Buying Used Cymbals: What’s your budget, what’s your goal? Used cymbals can be sold separately, and they’re also commonly included with a set of used drums. 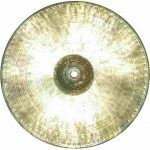 You can easily find anything from cheaper beginner cymbals, right up to some amazing top-of-the-line used cymbals. If you’re lucky, you might even come across some one-of-a-kind or custom cymbals. What you buy depends on your goals and your budget. The great thing is, you can save a lot of money at all price ranges buying used cymbals vs. new ones. For a beginner setup or a cheap practice kit, it usually makes sense to buy lower quality cymbals. With these, you can spend time working on your technique, and learning what kind of sounds you want (and don’t want). You can slowly upgrade and expand your cymbal collection once you’re ready. At the other end of the spectrum, there are usually great used cymbals available for drummers looking for top quality gear. Often, very expensive used cymbals are in great condition… experienced drummers have better technique, and they know how to look after their gear. Regardless of what you’re shopping for, make sure you check those used cymbals for problems… That’s where this guide comes in! Like with drums, you’ll find a lot of used cymbals online with craigslist, Kijiji, Gumtree, Facebook musician groups, and eBay. If you live in a smaller town, widen your search to the nearest city (if you’re willing to travel). Also look at local drum stores and pawn shops – many of these places will have used cymbals and other used drum gear. If you’re not sure of a used cymbal’s value, check out its new price on Amazon or your favourite music store. This should give you an idea of whether it’s a high-end used cymbal, or a cheaper one. Take your time when shopping, sometimes it can take a while for your perfect cymbal to appear. When you’re buying used cymbals, make sure you pay close attention to the things listed below. 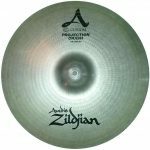 These will directly affect a cymbal’s usability, sound, and lifespan… If a used cymbal has any of these problems, you’ll want to rethink whether you buy it (and how much you’ll pay for it). Usually. Especially if the cracks are big ones, or they’re in bad areas. Some cracks can be fixed (see below for more on this), and some can be ignored if you just need some cheap practice cymbals. Cracks affect the structural integrity of cymbals, and they’ll slowly spread over time (remember you’re hitting these things with wooden sticks!). The harder you hit cracked cymbals, the quicker the crack will spread, although using proper technique will help. You can sometimes actually hear a crack in a cymbal, especially if it’s around the edge. Cracked cymbals will make a sparkling sound when they’re hit – this is the crack vibrating with the cymbal. I’ve known very experienced drummers who actually choose cracked cymbals, because they find this sound interesting! In general though, it’s bad news if you find used cymbals with cracks in them. Poor cymbal hitting technique. Don’t hit straight down through a crash, splash, or china cymbal. You should hit the cymbal with a glancing swipe. Think more of a side-to-side stroke, rather than straight down. Your cymbals will sound more musical when hit this way, and they won’t flop around as much (this is important when recording). Poor hitting technique will cause cracks on the edge or bow of a cymbal. Metal-on-metal contact. Putting cymbals directly on a metal cymbal stand will cause cracks around the center mounting hole. Always use plastic sleeves on your cymbal stands, and put the cymbal between two cymbal felts. Cymbals mounted too tight. Cymbals should be able to freely swing from side to side when they’re on the stand. If they can’t do this, cracks are much more likely to occur around the bell or mounting hole. Hitting way too hard. Cymbals are built to take constant hitting, but there’s a limit to how much they can handle. If you’re constantly laying into your cymbals, they’re much more likely to crack. Go easy on them! Always check used cymbals for cracks before you buy them. Large cracks are instantly noticeable, and they’ll have a big effect on the cymbal’s value. 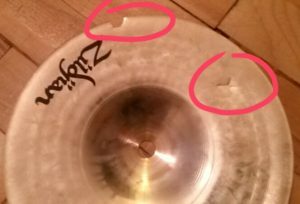 Smaller cracks can be harder to spot, so take a minute or two to look for them before you buy used cymbals. This used cymbal has a chunk missing on the edge, and a big crack on the bow. Check the used cymbal’s edge, both for cracks and for rough areas/dents. 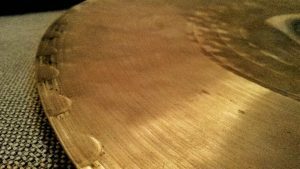 If the edge feels rough or has dents, it suggests the cymbal hasn’t been taken care of. Dents are usually caused by cymbals hitting a hard floor… Either being thrown down while they’re in a cymbal bag, or hitting the ground without a bag. It’s a good sign if the edge is nice and smooth, although used cymbals could still have edge cracks. You’ll instantly notice larger cracks around the edge of a used cymbal. To find smaller cracks, run your fingernail around the cymbal’s edge, pushing moderately firmly. Your nail will feel any tiny cracks. Cracks around the edge of a cymbal will mean that the cymbal is worth less, but not worthless. Small edge cracks are fairly easy to repair, and we’ll cover this further down the page. Unless you repair cymbals with edge cracks, you’d need to be more gentle when playing them. The crack will slowly grow, until the cymbal becomes unusable. Once you’ve checked the edge, look over the bow (the body of the cymbal) and the bell. Cracks in the bow are caused by hard hitting in that area. Cracks where the bell meets the bow are usually caused by cymbals being mounted too tight. This used cymbal has a large crack between the bow and the bell. Do a quick visual inspection of used cymbals to check there are no cracks here. If you notice any cracks around the bow or the bell, the cymbal’s value will be dramatically reduced. Cracks in the bow will slowly spread as you use the cymbal, unless you play it extremely gently. Cracks where the bow meets the bell are more problematic, and are more likely to spread even with lighter use. I’d recommend avoiding cymbals with cracks around the bell. You could tolerate these problems if you just need a cheap practice set, but expect to replace those used cymbals eventually. You can sometimes repair cracks in the bow or around the bell, although it’s more difficult than repairing edge cracks. See below for tips on how to do this. 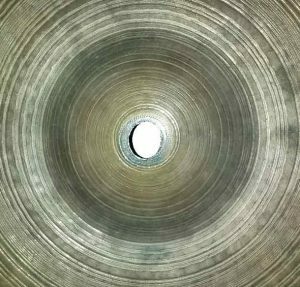 Take a look at the used cymbal’s center hole. You’ll see any large cracks, and you can run your fingernail around the hole to be sure there are no smaller ones. If the hole is no longer round, the cymbal has probably had long-term metal-on-metal contact. This is known as keyholing, and won’t affect the cymbal’s sound (see the section on keyholing below). If you notice this, double-check for cracks. Small cracks around the center hole are going to be a problem, and they’ll dramatically reduce the value of a cymbal. Very tiny center cracks are less likely to spread than edge and body cracks, but they’re more difficult to repair. For cheap used cymbals with these type of cracks, it might still be a decent deal if you’re on a tight budget (just be gentle when you play them!). Usually though, I’d recommend avoiding cymbals with cracks around the center hole. The things below are often seen on used cymbals, however they’re not huge deal-breakers. Most of these things are simply cosmetic issues, and won’t get worse as long as you take proper care of your used cymbals. Importantly, the issues listed below shouldn’t affect the sound of your cymbals. USED Cymbals: Is This A Deal-Breaker? No, as long as the hole hasn’t grown extremely wide. Keyholing is when the center hole of a cymbal grows bigger, usually due to a lot of use without cymbal sleeves. The metal-on-metal contact slowly wears down the area around the hole. This used hi hat cymbal has a moderate amount of keyholing. It’s otherwise it’s in great condition, and the keyhole doesn’t affect the sound. Importantly, it still mounts fine. I’ve used this cymbal for three years without any further issues. Keyholing isn’t a deal breaker, as long as the hole isn’t huge (the cymbal should still sit comfortably on a stand), and as long as there are no cracks around the keyhole (check carefully for these). Keyholes don’t noticeably affect the sound, and the used cymbal should still last a long time if there are no cracks. Always use cymbal sleeves and cymbal felts when mounting your cymbals to avoid keyholing. Used cymbals with keyholing will be worth less than cymbals with no keyholing. However, at the end of the day, the cymbal will still function and sound the same. Take care of it, and it’s likely that the problem won’t progress into something more serious. Asymmetrical keyholes can sometimes grow faster, because the cymbal always leans to one side. However, this will take a very long time if the cymbal is protected with sleeves and felts, and isn’t worth worrying about. As long as the keyhole isn’t huge, you can safely buy used cymbals with this problem. If you’ve got a larger keyhole, check out The Grombal cymbal mounts. These mounts will slow the hole’s growth, and allow the cymbal to mount better. No. To be clear, though, you should avoid put tape on your cymbals… It looks ugly, leaves residue that is really hard to remove, and there are much better options out there. However, it’s not the end of the world if there has been tape on the used cymbals you’re buying. They won’t be worth as much as shiny tape-free cymbals, but tape marks on cymbals is a cosmetic issue rather than a structural problem. If there is a lot of tape across the cymbals, they might sound different even after the tape is removed. Importantly though, they’ll sound normal once you get the tape residue off. How do you remove tape residue from cymbals? You can clean brilliant finish cymbals with cymbal cleaner, but other types of cymbals are best left as they are… otherwise you can actually change the surface of the cymbal. If your cymbals aren’t brilliant finish, you can use a dry (or very slightly damp) cloth to clean them. Make sure to dry off any water reside right away. You should expect to pay less for used cymbals with a lot of tape residue. Importantly though, a little bit of tape shouldn’t affect the sound too much. You might actually find a bargain if someone hasn’t been looking after their cymbals very well. No. Stick marks will naturally appear on cymbals as you use them. While they can change the look of a used cymbal, stick marks won’t affect the sound. Some types of cymbals will mark more easily than others, but overall it doesn’t affect anything besides the visual appeal of the cymbal. Stick marks won’t affect the value of a cymbal like tape marks or keyholing. They can often be cleaned with a dry cloth, or with cymbal polish if the used cymbal has a brilliant finish. No. Fingerprints will naturally build up over time, although best practice is to avoid putting them there in the first place. 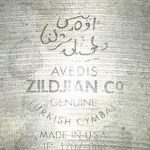 There are a few fingerprint marks on this Zildjian used cymbal. Fingerprints won’t noticeably change the sound of a cymbal – this is just another cosmetic problem. If there are a lot of fingerprints, used cymbals will look less appealing. Your skin has oils which can transfer to cymbals when you touch them, and these oils can cause discoloration as they interact with the cymbal’s surface. However, it takes a lot of oily fingerprints across many decades before the cymbal has any real structural changes. A few fingerprints are normal on used cymbals, and won’t affect their value. Like stick marks, fingerprints can often be cleaned with a dry cloth, or with cymbal cleaner if the used cymbal has a brilliant finish. If there are a lot of bad fingerprints on a used cymbal, you might pay slightly less for it. As well as usually having a black printed logo, most cymbals have a logo stamped or engraved into them. On old used cymbals, this can sometimes be the only way to identify them… The printed logo wears off over time (and with cleaning). 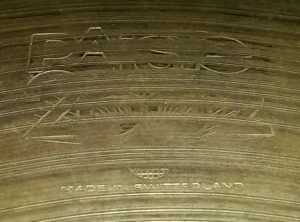 The logo on this used cymbal was a little hard to find… This is a Paiste 2002 from the 1970’s. Look around the bow of the cymbal for a logo to confirm it’s actually the cymbal you expect it to be. Sometimes even these stamps/engravings can be worn down. Zildjian cymbal dating: Rob Scott’s very detailed guide. Paiste cymbal timeline, and a PDF with Paiste serial number information. UFIP cymbal dating guide: Thanks again Rob Scott. Unfortunately, there’s not much out there for dating Sabian cymbals. If you find better cymbal dating resources, please let us know! Used cymbals buying guide: Hit it! This one is important if you’re using the cymbals for anything other than practicing: Don’t forget to hit the cymbal a few times to hear how it sounds. Two cymbals will never sound exactly the same (even if they’re the same brand, model, and size), so listen to the sound of a used cymbal before you buy it. Take a second to think about whether it fits with your sound. Used hi-hats and used ride cymbals are pretty tough… these cymbals are usually stronger than other types. They’re not immune to problems, but they’re less likely to have cracks. For used crash cymbals, look a little closer for cracks. Crash cymbals often get hit harder, so there’s more potential for damage. The same goes for used splash cymbals. For used china cymbals, cracks can hide in the bow. To find cracks in a used china cymbal, gently flex the cymbal’s bow by bending it slightly… Hidden cracks in the cymbal’s curve will be more noticeable when you do this. 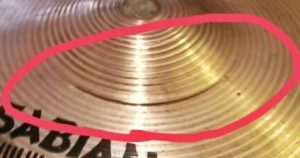 This area often takes the full force of a china cymbal hit, and so it’s the most likely place where a used china will have a crack. 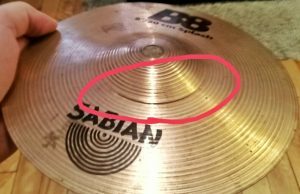 CAN A CRACKED CYMBAL BE FIXED? The size of the cymbal’s crack will have a big impact on how repairable it is. Edge cracks are the easiest to stop from spreading, and will have the least impact on a cymbal’s sound once they’re repaired. Bow cracks are slightly worse, although they can still be stopped from spreading. Cracks on the bow will compromise more of the cymbal’s structure compared to edge cracks. Cracks where the bow meets the bell will have a much greater effect on the cymbal’s durability. These can sometimes be stopped, but often they’ll spread unless you’re really gentle with the cymbal. This part of the cymbal is often under more stress when hit… it’s the joint where the hard bell meets the more flexible bow. Center cracks are even more difficult (or sometimes impossible) to repair. If they’ve spread a long way, you’ll need to cut a big hole out of the center. Unfortunately, this makes it impossible to actually mount the cymbal. I’d recommend avoiding these cymbals, unless you’re willing to get very creative with repairs. 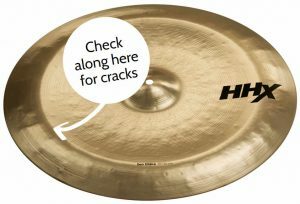 Tiny cracks on the edge of a cymbal can be fixed: you can carefully grind down the area to remove the crack, without affecting the cymbal’s sound too much. Use an electric grinder to do this. Bigger cymbal cracks are bad news… the more you need to grind out of a cymbal, the more its sound will change. However, even larger cracks can be cut out without destroying the cymbal. Alternatively, you can drill a small hole at the end of the crack. This will stop it from spreading further, and is a good option for longer cracks you don’t want to grind out. Be aware that if the crack is very long, parts of the cymbal can still break off (even after you’ve drilled the hole). Take extra care when you play cracked cymbals. Cracks on a cymbal’s bow can usually be stopped from spreading. Drill a hole at each end of the crack to stop it from growing longer. 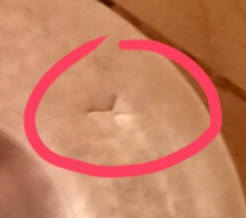 Note that larger cracks in a cymbal’s bow may spread even after you’ve drilled these holes… Be gentle with these cymbals. As a more extreme measure (for large bow cracks), you can use an electric grinder to remove the cracked part of the cymbal. This will have a greater impact on the cymbal’s sound, so don’t remove more than necessary. If the bell is cracked, you can drill both ends of the crack to stop it from spreading. However, I’d avoid cymbals with cracks in the bell, or where the bell meets the bow… These cracks are more likely to spread, especially if you still hit these cymbals at full-force. Once a cymbal is cracked in this area, be gentle! The short answer is: unless it’s a tiny crack, you can’t. I’d avoid cymbals with cracks in the center hole, unless you want to get really creative with repairs. I’ve seen people who have removed the cracked areas, and attached a new mounting piece or grommet. The center hole takes the full weight of a mounted cymbal, so any damage will get worse over time. If you’ve got serious keyholing or some center cracks, check out The Grombal cymbal mounts. These mounts can take some of the pressure off the cymbal’s mounting hole, to reduce the spread of damage. Regardless of the crack’s location, and regardless of whether it is repaired, go a little easier on cracked cymbals. They won’t be as tough as they used to be, but might still last a long time if you look after them. Whether you buy cracked cymbals depends on what you’ll use them for, and how long you’ll keep them. A cheap practice kit will be fine with one or two cracked cymbals, but a gigging or recording kit probably won’t be. If the cracks in the cymbals aren’t mentioned in the advertisement, you should be able to reduce the final sale price. 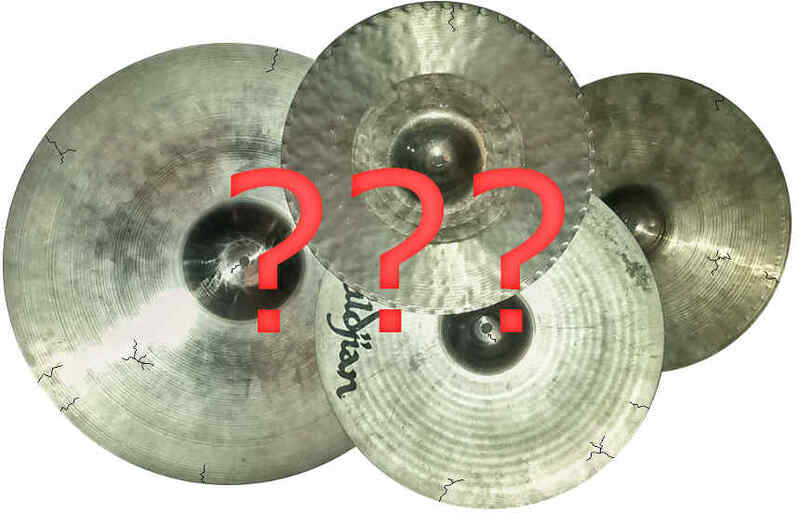 Used cymbals buying guide: What about used drums? Great question! 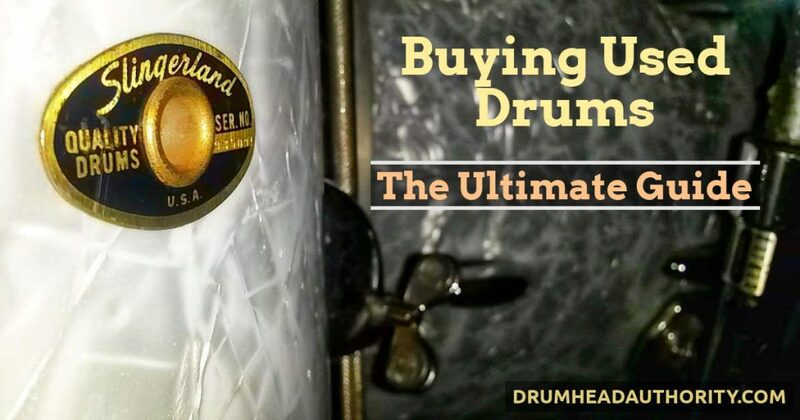 I’ve written a huge article for buying used drums too, with everything you need to know when buying a used drum set. Don’t miss out on any new articles: like & follow our Facebook page! Need quiet cymbals? Check out our review of Zildjian Gen16 and L80 low volume cymbals. There’s also tips to reduce drum volume, and a huge drum dampening and drum muffling guide. Got any other tips for buying used cymbals?